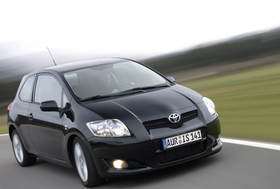 Toyota will start output of a hybrid version of the Auris in the U.K. next year. TOKYO (Reuters) -- Toyota Motor Corp. will buy hybrid-car batteries from Sanyo Electric Co., a source familiar with the matter said, as the automaker struggles to meet growing demand for the fuel-saving vehicles due to a shortage of battery supply. Sanyo and Volkswagen AG signed a deal in May 2008 to jointly develop lithium-ion batteries. Toyota, which will start producing hybrids in Europe next year, now gets its batteries from Panasonic EV Energy Co., a joint venture with Panasonic Corp. Panasonic plans to take control of Sanyo and is awaiting regulatory approval. Demand for gasoline-electric hybrids has surged in Japan, helped by tax breaks and subsidies under a government initiative to promote fuel-efficient automobiles, but Toyota has said production of its most thrifty models is being held back by a supply bottleneck for batteries. Toyota, the world's biggest automaker, will first use Sanyo's lithium-ion batteries starting in about 2011, said the source, who confirmed a report in the Nikkei business daily and spoke on condition of anonymity because the information is not yet public. Toyota will first procure about 10,000 battery units a year from Sanyo, the world's biggest rechargeable battery maker, the source said. Toyota aims to sell at least 1 million hybrid vehicles a year in the early 2010s. The news sent Sanyo's shares up 17 percent at one point. They ended the day 10 percent higher at 247 yen (about $2.62), while Toyota inched up 0.3 percent. Panasonic EV Energy has said it plans to double battery production capacity to about 1 million units a year by the middle of 2010. To further ease the supply shortage, Toyota has said it is considering a wide range of options, including procurement from a second source and further capacity expansion at the battery venture. Sanyo told Reuters in June that it had secured customers for its lithium-ion batteries in the United States, Japan and Europe as it seeks a 25 percent share in the global market for auto-use rechargeable batteries by 2015. VW and Sanyo aim to have their first lithium-ion batteries ready for launch in 2010 in a model from VW premium brand Audi. Other battery makers such as Toshiba Corp. and the joint venture between Nissan Motor Co. and NEC Corp. are also looking to supply their batteries to a broad customer base to bring costs down. Shares of battery makers have been popular as batteries look set to become a core component in electrified cars, including plug-in hybrids and pure electric vehicles. But analysts warn that retail investors are mainly behind the surge and that they may be overreacting to the growth potential. "I think (Sanyo shares) are overbought," said Osamu Hirose, an analyst at Tokai Tokyo Research Center. "There's a lot of expectation about the company's rechargeable and solar cell business, but at the current price it's hard to imagine that any institutional investors would be buying," he said. According to Thomson Reuters, no brokerage has a "buy" rating on Sanyo, which has a price-to-earnings ratio of 67 times its estimated earnings. GS Yuasa Corp., which has battery ventures with both Honda Motor Co. and Mitsubishi Motors Corp., has an estimated PER of about 144 times. Separately, the Nikkei business daily said Toyota told its suppliers the previous day that it planned to raise its global production target for 2009 to 5.95 million units, up from 5.8 million. Douglas A. Bolduc contributed to this story.